« Fort Gordon is making an Impact with Programming and Special Events! Finding opportunities to professionally develop employees in an environment where both time and staff are in high demand can prove challenging. Because of this challenge, employers have an interest in determining that, when they are able to accommodate training space, the material employees learn “sticks”. After all, no employer finds value in spending time and money on training that doesn’t provide a benefit to the individual or organization. Recognizing this enduring need, Dr. Donald Kirkpatrick, former Professor Emeritus at the University of Wisconsin, developed a four-level model to determine training’s effectiveness. This since widely-used evaluation tool served as the subject of his Ph.D. dissertation in the mid-1950s and uses each individual level as a base for the next. Utilizing this model, employers should begin at the first level and work their way through Levels 2, 3, and 4 successively. 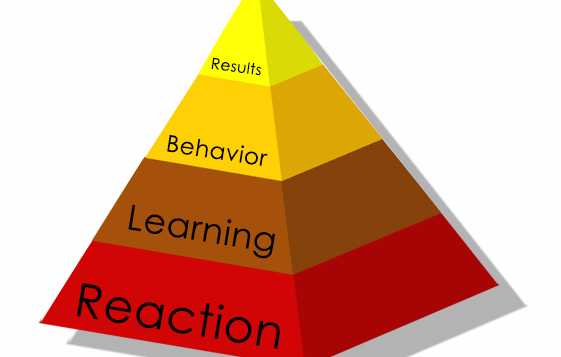 Level 1: Reactions is aimed at measuring a participant’s perception of a training event. Did they like it? Do they feel that it is applicable to their line of work? Do they think it aided them professionally? At the least, every training should be measured at this level. This can be accomplished by simply asking employees to complete a survey or provide feedback through interviews or focus groups. Level 2: Learning pushes evaluation past the student’s reactions to the material presented to how effective the training has proven to be in establishing a new set of skills or knowledge. This level can be accomplished through assessments such as tests, observations or teach backs. Level 3: Transfer is arguably the purest way to determine the effectiveness of an employee’s training. This level requires an analysis of the employee’s behavior changes resulting from the training. Level 3 evaluation techniques might include soliciting specific examples, through action plans or follow up assignments for instance, of how employees applied the training to their daily work. Level 4: Results is the highest, and hardest, method of evaluating a training’s success. This level attempts to show the concrete results to the organization. This can be seen in areas such as increased productivity, higher work quality, improved customer service, or increased job satisfaction. Typically, this is accomplished through interviews or focus groups with upper management, stakeholders or through independent research. At each level, leaders play a critical role in the potential impact of training. Before training, leaders should take some time with employees and discuss expectations both parties have of the training. Employees should be encouraged to create an action plan during the training to document how new knowledge and skills will be applied. After the training, leaders should review the action plan with the employee and ask how they can be of assistance in implementing the plan. Plans should be SMART (Specific, Measurable, Achievable, Relevant, and Time-Dated). Periodically, leaders should check on plan implementation and when the end date comes, have a follow-up meeting to review the plan. This might include evaluating what worked, what might need improvement, and what new actions to reinforce. Partnering for success is the key for ensuring training sticks and makes a lasting impact on the employee and organization.